The Gophers’ new head coach brings a unique collective culture combined with his relentless positive enthusiasm that aims to energize and unite the State. Heather Fleck constantly hears the same question about her husband: “Is he like this all the time?” New Golden Gophers football coach P.J. Fleck exudes so much energy that even his wife was skeptical when the pair first met. Before Minnesota athletics director Mark Coyle hired Fleck to be the youngest head football coach in the Power Five conferences, the 36-year-old was already nationally known for his enthusiasm, his ability to transform a program, his participatory approach to practice and his Row the Boat mantra. Fleck gave Minnesota a taste of his lively vocabulary at his introductory press conference, and has been teaching it to his Gophers team since Day 1. Fleck’s Gopher Talk handbook defines a checkers piece as “one dimensional,” while a chess piece has “multiple values.” Fleck is not interested in being a checkers piece. Coyle hired him with confidence that he would hold Minnesota football to high standards academically, athletically and socially. For Fleck, it has always been about more than football, and he pours the same energy into each role or facet of his life. Fleck was a multi-dimensional student back at Kaneland High School. The “A” student, student council member and middle school mentor/tutor was a standout, year-round athlete. Fleck set the Illinois record for career receptions and helped Kaneland win two state football championships. He was also an all-state competitor in basketball and track. Despite his academic and extracurricular success at Kaneland, Fleck received only one scholarship offer to play football in college. He refers to himself as the “king of the toos,” realizing most coaches viewed him as too small and too slow. Fleck made the best of his opportunity, excelling as a receiver at Northern Illinois under coach Joe Novak. Fleck was not selected in the NFL Draft after college, but later made the San Francisco 49ers practice squad. He saw limited game action, but helping to coach young players while on injured reserve gave him a taste of the coaching profession. “From then on, I was hooked,” he said. Fleck spent seven years in various assistant coaching roles before he was hired at Western Michigan at age 32. He had achieved his goal of becoming a head coach, and began to make the job his own. He used “Row the Boat” and other phrases, acronyms and definitions to provide a common language around which he built the culture he wanted for his program. Fleck’s never-give-up mantra, “Row the Boat,” originated after the 2011 death of his newborn son, Colt. It helped Fleck to get through the aftermath, and provided a way to carry on Colt’s legacy. Row the Boat became the rallying cry for Fleck’s team. As he explains, the oars represent the rowers’ energy, the only thing propelling the boat. The boat represents sacrifice, giving up something in order to achieve a goal. A compass represents the direction set by the rowers toward their destination, a common goal. Rowers sit with their backs toward the future, which they can’t see. They row with their oars in the present, the only thing they can control. They decide whether to give up and stop rowing, or to continue and forge ahead. They look toward the past, from which they can learn. At Minnesota, Fleck will continue to use Row the Boat while also working to spread the Gophers’ long-time cheer of Ski-U-Mah. Other pieces of Fleck’s cultural vocabulary came from past coaches, players and experiences. He learned a lot about the concept of culture working under Greg Schiano at Rutgers and with the Tampa Bay Buccaneers. When Fleck started to make his own culture known, not everyone believed in its merit: too gimmicky, too corny. In 2013, Fleck’s first year at the helm, Western Michigan had only one win. In 2016, the Broncos’ only loss came in the Cotton Bowl. By that time, P.J. Fleck, Row the Boat and WMU’s rise to a No. 12 ranking had been featured in national media and captured college football fans’ attention. Fleck turned down other job opportunities in the past few years before choosing Minnesota. The Twin Cities’ multitude of opportunities and the statewide support the Gophers receive as Minnesota’s only Division I program were a few things that drew him to the job. The challenge of aiming for championships and Rose Bowls, which Minnesota has not done for decades, was another alluring factor. The new coach’s willingness to talk about big goals made an impression on quarterback Conor Rhoda. So did the energy level. Rhoda had planned to transfer until a conversation he had with Fleck the day after he was hired. Fleck told Rhoda he would like to renew his scholarship. The senior decided to stay, and it has already been a unique ride. Fleck surprised the team by replacing a conditioning workout with a whiffle ball tournament, in which he participated. For the Gophers’ last winter workout session, they played dodgeball, tug-of-war and other games. Injured players could still compete in non-intensive activities like cards and a bubble gum blowing contest. Rhoda said his final spring practice season has been faster paced than his previous ones. It has also included more written vocabulary quizzes as the Gophers gradually master Gopher Talk. Fleck constantly runs around the field at practice, even stripping the football away from his players in ball security drills. 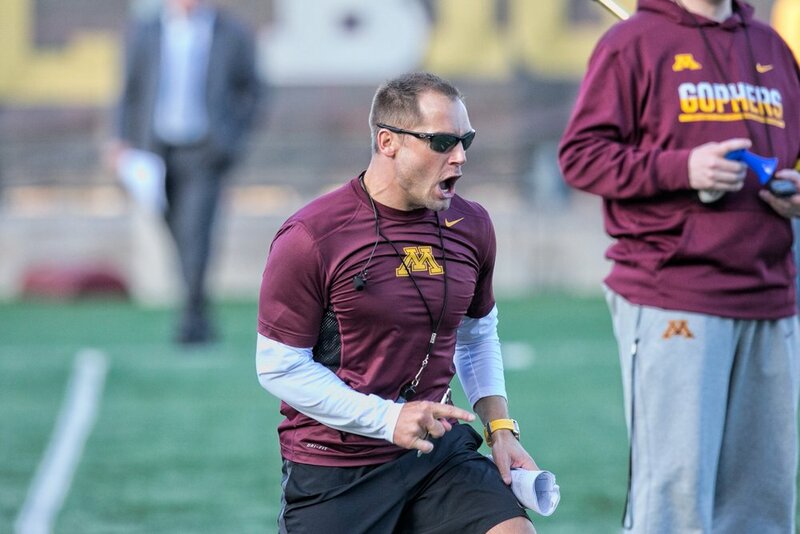 When he is not offering tips for improvement or praise for an “elite job,” Fleck spends time working on mental preparation and life lessons with the Gophers. Rhoda is part of the team’s leadership council, a few dozen players elected by their teammates. The council meets for a class with Fleck each week to learn about leadership through discussions and media their coach shares with them. Coaching and teaching are intertwined occupations, and education runs in Fleck’s family, with a teacher’s aide for a mother and a kindergarten teacher for a sister. Fleck can still rattle off the names of his grade school teachers and counts them as his biggest influence. In high school, Fleck dreamed of going into the profession that most affected his life. He even did some work in an elementary classroom as part of a senior project before going on to earn an elementary education degree at Northern Illinois. Between college graduation and the invitation to play in the NFL, Fleck briefly taught sixth grade social studies. Fleck enjoyed building a curriculum because it allowed him to use his creativity. Grades 6-8 appealed to him because he felt he could be the most influential to that age range. Fleck may have left sixth grade, but similar concepts apply to coaching college football. Every player learns differently. Coaches and teachers alike must ways to make their message relatable to the world of the age group they are teaching. Fleck’s skill in relating his message has been one of the biggest factors in his success as a coach. Fleck gave long answers at his first press conference, and opened his National Signing Day press conference with a 37-minute statement before starting the Q&A portion of the event. He has come a long way since his first speech class in school. “I was afraid like everybody else initially for public speaking, but you become so used to it, it becomes part of your message,” Fleck said. Fleck’s comfort in front of a crowd and “built-in microphone” come in handy on the practice field and in locker room speeches. He rarely needs an actual microphone. “He always says that your voice is your confidence, and I noticed he was very loud,” Heather said. Fleck’s confident voice was responsible for much of the national media attention Western Michigan received in recent years. He has been invited to speak at coaches’ conferences and numerous other engagements. Fleck said he enjoys media interviews, even when there are tough questions. One of his most memorable one-liners on his first day in Minneapolis was: “I eat difficult conversations for breakfast." Fleck’s ability to hold attention impressed Coyle in their initial meeting. Fleck wants to involve his family in the Gophers program as much as possible. Heather goes to the Gibson-Nagurski Football Complex every day, often to get lunch with P.J. She has gradually been getting to know the Gophers and hopes they will feel comfortable approaching her for life advice if they need a resource. She also wants to be involved with the team’s community outreach efforts, especially with the U of M Masonic Children’s Hospital. Fleck will occasionally wake Heather up in the middle of the night to discuss ideas that pop up about football or family. They’ll turn the light on, discuss and make sure the idea is recorded on paper or a phone memo. The Flecks have four children: Gavin, Carter, Paisley and Harper. They signed mock National Letters of Intent on February’s Signing Day, and have lived up to their imaginary commitment to the Gophers. Fleck kids have been spotted at spring practice, in the football lounge playing games against Goldy and Minnesota players and at Mariucci Arena cheering on Gopher hockey. Sometimes Fleck’s energetic return home even interrupts the kids’ bedtime routine. Heather and the kids have a tradition of dancing in the kitchen every morning, which P.J. will join when he is home. All this fun doesn’t mean the family is exempt from adhering to the principles outlined in Gopher Talk. Fleck said his main hobbies are spending time with Heather and “creating moments and memories” with their kids. For Fleck, F.A.M.I.L.Y. stretches beyond his literal family and his team. He said his mission, and Gopher football’s mission, is serving and giving. Visiting the children’s hospital and participating in volunteer events will be part of that. Being involved in other Gopher teams is part of it. A “Fleck Olympics” of sorts is in the works. Fleck hopes to participate in a practice with every Gopher sports to get to know those teams and help bring them wider recognition for their accomplishments and hard work. Fleck wants Row the Boat to extend to people who do not even like football. A program to distribute custom oars to different people and organizations is in its infancy. Fleck has been all over the Twin Cities during his first couple months as head coach, including the U of M Masonic Children’s Hospital where he makes monthly visits with the team (above left). Fleck has also made a wide variety of media appearances including KARE 11 and KFAN (bottom). Fleck also visited the state legislature and Governor Dayton with Heather (above right). Fleck is active on Twitter and was flattered one day to see the beginning of a new trend: Fleck Friday. What started as a group of Gopher staffers wearing Fleck’s signature game day look of a quarter-zip jacket over a shirt and tie has taken off on social media at the end of each work week. In the course of his research before taking the job at Minnesota, Fleck came across the Gophers’ motto of Ski-U-Mah. Legend has it the phrase originated with a canoe race. With canoes, paddles and the North Star for a compass, how could Fleck say no to Minnesota? “It was one of those signs that you’re not looking for but it finds you,” he said. Row the Boat may primarily be a metaphor, but Fleck will have a chance to take it literally with the Gophers rowing team and their on-campus boathouse. Fleck owns a boat and enjoys being on the water, fishing, wake surfing and jet skiing. In that case, Fleck is in the right place. The Mississippi River runs through the University of Minnesota campus, and the Land of 10,000 Lakes more than lives up to its nickname. Ski-U-Mah and Row the Boat should get along just fine. To read more about P.J. Fleck, click here to see the full Ski-U-Mah feature (pages 28-33). Justine Buerkle is an assistant athletic communications director for Gopher Athletics.